It’s winter. If you live in Wisconsin that means you may have to decide between a heat gun and a blow torch for many tasks around the house. I’ve written this brief guide to help you out based on my heat gun and blow torch usage in the last week. Frozen door knob on garage. For this task I choose the blowtorch. The door knob is metal so I figured it could take the heat of the propane blow torch just fine. Also, since there is no power outlets on the outside of the house, it would have meant running power from the kitchen, and that wasn’t appealing in any respect. Blow torch wins. Frozen water line. There is a water line running into the refrigerator from the basement. The line is a small plastic tube and it’s close to the outside wall of the house so it freezes easily. For this task I choose the heat gun. Power was readily available, and there were too many flammable or melt-able items near the water line to risk using the blow torch. Heat guns wins. Frozen gas tank door. This was a tough one… I would have preferred to use the heat gun, but the lack of power outside forced me to use the blow torch. While this worked, I was slightly nervous about putting an open flame to the fuel tank door. A few quick swipes provided enough heat to get the door open though, and it all ended well. Blow torch wins, but Heat guns would have been preferable. 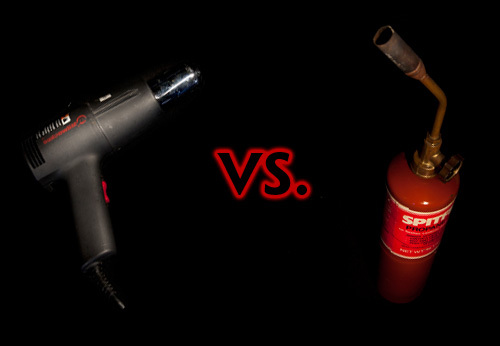 As always, caution must be exercised when using either a heat gun or a blow torch. They can both melt things (including you!) and they can both set things aflame. Respect your tools, and your heat sources, be careful, be safe, and hopefully you’ll have no problems. Enjoy the next 6 months of winter!